Every locale has its signature drink, which usually signals a preference for coffee or tea. In Portland, Oregon, it might be Stumptown drip or espresso coffee. In Australia, we drank cappuccinos with every meal. In Japan, it’s green tea or matcha—ground green tea that is blended with water and sometimes milk and sugar (matcha latte). We had fun watching matcha being ground in Kyoto. There are so many types of green tea to count, and I’d like to try them all. The antioxidants in green tea have been attributed to the long lives of Japanese people. Starting the morning off with a few cups of Masala Chai. 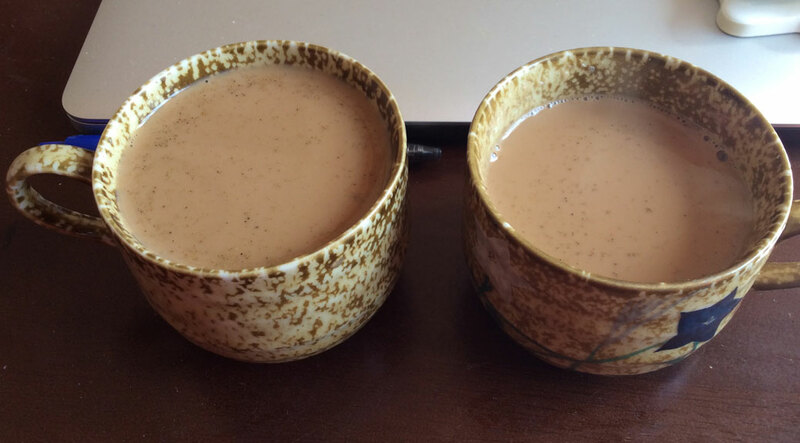 In India and Nepal, THE drink is undoubtedly masala chai (the wiki read is fascinating). The spicy, sweet drink quickly became a favorite among our group members. However, not all masala chai is created equal. It became a game to rate each cup and declare whether it was the best we’ve had. In Nepal, masala chai is a little weaker…more similar to milk tea. Milk tea is also popular here in Japan and it’s, you guessed it, (black) tea with milk and sugar. If you’ve had a chai latte from Starbucks, you have an idea of the flavor of masala chai. In India, the milk is brewed with the tea, instead of adding it later. You can also get some Chai tea bags and add some milk, but it’s not the same. We had masala chai on the street, in restaurants and in people’s homes. While we were in the city of Orchha, India, we had an opportunity to meet a woman who taught us some traditional recipes. 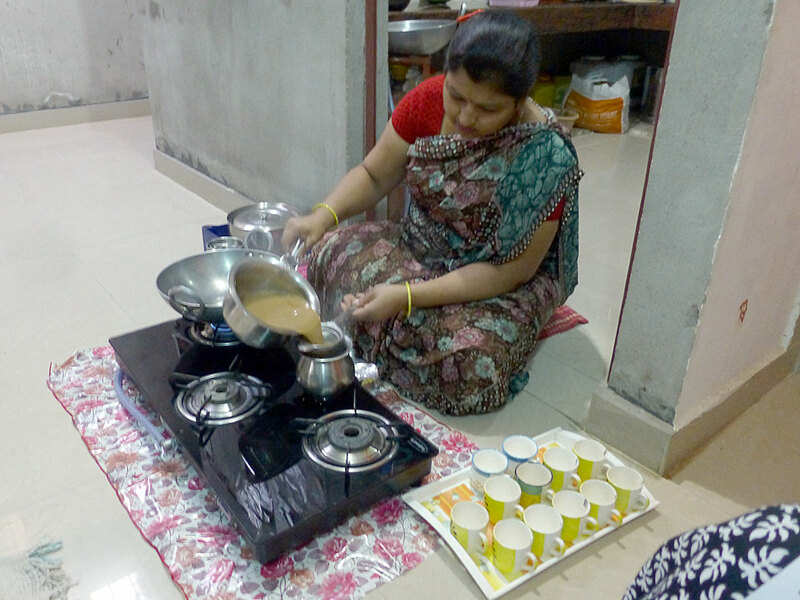 Vandana Dubey strains the chai tea from the spices and loose leaf tea. Below is my adaptation of Vandana Dubey’s Indian spiced tea. This drink has “warming” spices: best drank in the winter. Step 1: Lightly crush the cinnamon, cloves, cardamom and peppercorns. The best way is probably a mortar and pestle, but who has one? I break the cinnamon stick into small pieces and place into a medium saucepan. Then, I throw in the cloves, cardamom and peppercorns. I use the back of a wooden spoon or a potato masher (use what you got) just to break ’em open. Step 2: Grate the ginger into the pot. Step 3: Throw in the black tea and sugar. Step 4: Add the water and bring to a boil. Boil for about 5 minutes. It’s going to smell amazing. Step 5: Add your milk. If you can heat the milk beforehand, that’s best, but if not, add your cold milk and bring it back to a boil. Then, bring down to a simmer for about 2-3 minutes. Step 6: Get your cup(s) ready and find a fine strainer. Strain the liquid from the solids. Step 7: Add a pinch of garam masala if you like and enjoy! Ginger is the main flavor here. We didn’t have any one day and it tasted all wrong. I also didn’t have a cinnamon stick for one batch. Ground cinnamon is not a good replacement. Powdered versions of any of the spices don’t suffice. If you don’t want to go out and buy all the spices, you can still make a good batch with just ground fresh ginger and a cinnamon stick. If you’re unsure about how much sugar you’ll prefer, you can leave it out here and add as you like to the final product. You can also leave out the sugar and add sweetened condensed milk at the end. If the tea is too “spicy” for you, add more hot water or milk to dilute. Garam masala is a powdered blend of most of the spices in the recipe: peppercorn, clove, cinnamon, cardamom, nutmeg, etc. If your grocery store has bulk spices, buy a tiny bit of it to try. Let us know if you try the recipe and how you “make it your own.” What is the signature drink where you live? I’m not a tea person, but this sounds so good! It’s a treat! Do you find that people drink more coffee or tea in your travels?